Since 1983, the Art Rock Festival in St Brieuc, mixing styles and subjects, has distinguished itself as one of the major events on the French music scene. In June 2005, the very prestigious Carte Blanche was offered to Olivier Assayas. During one night, two stages at the festival played host to collaborators and friends of the director, an eclectic programming of concerts, lectures and experimental cinema. This exclusive documentary is a virtual laboratory of images blending in with sound. 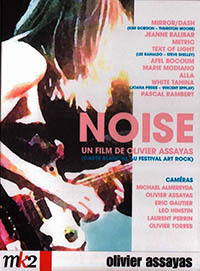 Unpublished documentary, filmed during the carte blanche confided to Olivier Assayas by the festival art rock, NOISE is a laboratory or without a priori and without Frontiered, the images blend into the music. The flights of the musicians of SONIC YOUTH, a group lighthouse of the New York avant-garde, cross the Malian blues by AFEL BOCOUM or melancholy haunting of MARIE MODIANO. The rock energy of METRIC or that of JEANNE BALIBAR and RODOLPHE BURGER, dialogue with improvisations inspired by ALLA, an oud virtuoso. Experimental film assembled at the request of Mirror/Dash to support their performance at the Art Rock Festival made by olivier assayas and luc barnier. Emily hates and Metric live in St Brieuc and in the Parisian night made by leo hinstin and olivie torres.